Installed next to the Dome of Visions in the Aarhus harbour, the Aarhus Urban Algae Folly will serve as an incubator of the micro-ecologies present in the city’s waterways. The installation will make such ecosystems visible to the public, and contribute to Aarhus’ metabolism by filtering urban wastewater, digesting organic waste, cultivating bio-fuels as well as super-food for humans and animals. 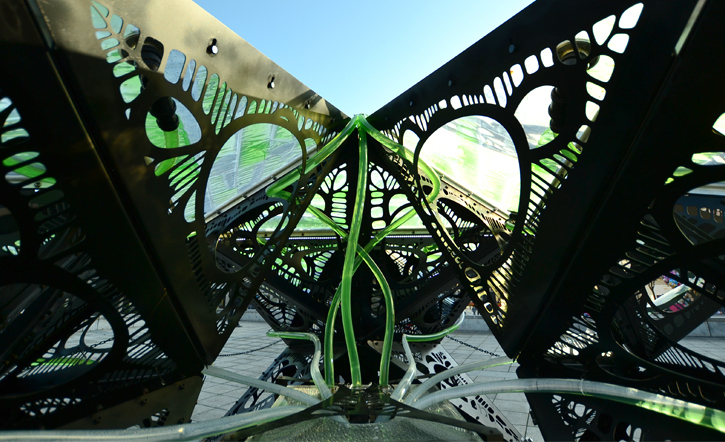 The Urban Algae Folly, by ecoLogicStudio, is the world’s first living architecture, integrating micro-algae cultures and real-time digital cultivation protocols within a custom soft ETFE (Ethylene tetrafluoroethylene) plastic skin. While the Urban Algae Folly will be a focal point of attraction in the public realm, Aarhus Wet City is a planning interface that shows the nature of blue-green ecosystems as networks whose proliferation is influenced by ecological and human feedbacks. On one hand, the project maps every single tree in Aarhus to highlight how tress constitute a natural urban network, in its various levels of connectivity, above and below ground. On the other, by computing topographical analysis, rainwater flow patterns, energy, water and road infrastructures, the interface can visualize for any user (individual) the shortest and most oxygenated paths across the city. Throughout the entire exhibition period, trees around the city will be fitted with a QR code – a digital tag providing information about their location, specie, age and size – and will engage the public in the design of a new collective map of the city.